Light was founded by Joe Hollier and Kaiwei Tang, an artist and product designer who met inside of a NYC-based Google incubator in 2014. Together they created a new cell phone that is just that, a phone. This is a 4G LTE phone with a beautiful black & white matte E-ink display. The phone can place calls, text, set alarms, call an Uber, give directions, play music, and tell you the weather. The phone does not have any social media, advertising, email, news, or web searching. They call this “going light” and by doing so you are allowing yourself to disconnect and enjoy your life outside of our existence through hyper-connectivity. Simple communication is the heart of the device, you can leave the house for an adventure without feeling completely disconnected and enjoy life without social media. 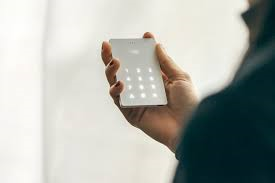 The Light Phone is only $250 and can be purchased in plans; Couple (2 for $450), Family (4 for $850), and Team (10 for $2,000 ideal for a small office). If you’re a parent this phone can sound especially appealing when your children are begging for a phone like the rest of their friends. Its been debated on when to give your child a phone and how to monitor what they are doing with the smart phones given to them. Regardless of parental controls they still have the world in there back pocket- good and bad. This new light phone can be a simple solution to that. They won’t have a camera, social media won’t be accessible 24/7, and they will still have the tools to be in connection to the people who matter. Light phone is still in the prototype stages and is going to be released in April 2019. To learn more about the product details click here or you may find this article about why the light phone is great for children.